Roger the striped skunk began his life in another state as a pet. His owners brought Roger to Arizona in 2014 and then discovered that it was not legal to keep him here as a pet. He needed a sanctuary home where he would be safe and well cared for. Southwest Wildlife is that home. Roger is now one of our education animals. He arrived at the sanctuary already de-scented, so spraying is not an issue. This portly skunk makes a great ambassador for our Education Department because he’s so calm and relaxed around people. We have discovered that Roger doesn’t see well, though. His vision may be poor due to an inadequate diet when he was young, but we can’t be sure. 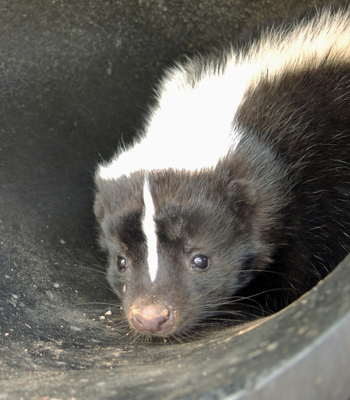 Sponsoring Roger provides care for all of our sanctuary skunks, including his roommate, Violet.